STUNNING and easy to fit. Out of all the chrome trim I've bought which is most of it I would say the steering wheel trims and the seat belt trims are the most impressive and take the MX5 to a higher quality level. It seems a shame we have to spend so much on these fittings when Mazda could of thrown a few in on the basic model. 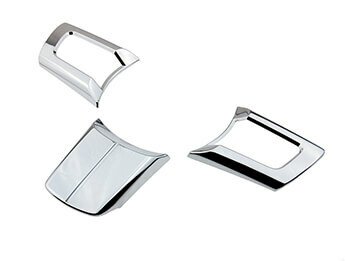 This chrome trims really are detailed and make your MX5 look amazing and special. 5 stars! Usual fast service from MX5Parts and terrific quality pieces. I stupidly marked the silver spokes on my steering wheel and these are the perfect items..
Will this item fit the mk3.75 Sport Venture 2014 model. Looks like it should but it doesn't mention it in the description?.. STUNNING and easy to fit. Out of all the chrome trim I've bought which is most of it I would say the steering wheel trims and the seat belt trims are ..
Super fast delivery. An easy 5 minute fit. Make sure to de-grease the wheel thoroughly before fitting. The parts are marked R/H & LH on the back. Look.. Ordered as part of a much bigger interior chrome package. Probably the easiest of everything to fit! Dry fit first as they only go in one position and..
Great value and complements the aftermarket chrome rings around the instrument panel purchased from here. I did email the parts team and ask if they k..
Usual excellent service. These covers? WOW. Installed these today, GREAT fit and they really look AWESPOME. 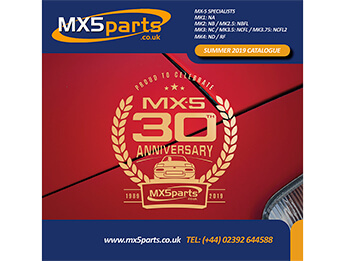 happy new year to you all at mx5 parts if only all companys where this good first class products,first class service,and of course first class deliver..